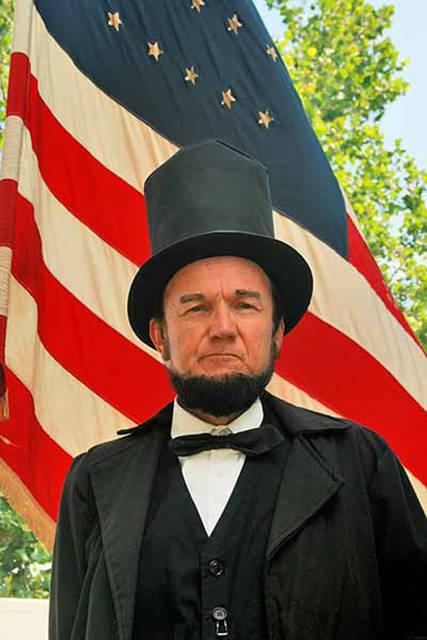 Abraham Lincoln impersonator John Cooper will return to Greenville on July 13. GREENVILLE – The public will have two opportunities to meet with the “16th President of the United States” when he presents “A Biography of Lincoln’s Life” on July 13. These are free events open to all ages and no registration is required. The first event is noon on the Greenville Public Library lawn so bring a blanket or lawn chair. The second is at 2 p.m. at the Brethren Retirement Community in the Brick Room. Lincoln impersonator John Cooper is a self-avowed history nut and considers Lincoln his favorite and the United States’ greatest president. He has portrayed President Lincoln for more than 25 years with the aid of his tall stature, Lincoln-styled beard and coat, and stovepipe hat. Cooper has appeared all over the US and locally at the Darke County Fair and Trinity Wesleyan Church. He gave two programs at the library in February 2017 and gained quite a following. See www.fourscore7yearsago.com/lincoln.html for more information.